[187 Pages Report] The global Higher Education Market size was USD 47.95 Billion in 2015 and is projected to reach USD 70.62 Billion by 2020, growing at a Compound Annual Growth Rate (CAGR) of 8.1% during the forecast period. The higher education market is commonly defined as learning that is imparted through contexts such as social and content interactions with the help of hardware such as personal computers (PCs), interactive white boards (IWBs), etc. These solutions are focused on improving the overall learning experience for the end users that require constant and situated learning support. The target audiences for this higher education market report are education support service providers, higher education consumers, state or local government, technology solution providers, and higher education hardware providers. Adoption of device-based computing, increased connectivity of hardware, emergence of online and collaborative learning, and personalization of technology are some of the factors driving the adoption of higher education solutions. The higher education market scenario for higher education is a substantial one with major mergers and acquisitions such as Verizon with AOL, Inc., Cisco Systems with Metacloud, Blackboard with Schoolwires, and IBM Corporation with StoredIQ. Besides this, various solution providers such as Ellucian and IBM Corporation are developing innovative techniques of advanced learning management features into their solution offerings. North America is estimated to have the highest adoption rate of higher education, and regions such as Latin America along with Middle East and Africa offer a lot of opportunities for the vendors where a majority of the countries such as United Arab Emirates and Saudi Arabia are yet to expansively adopt these solutions. This report analyzes the global adoption trends, future growth potential, key drivers, restraints, opportunities, challenges, in the higher education market. The report also examines growth potential market sizes and revenue forecasts across different regions. 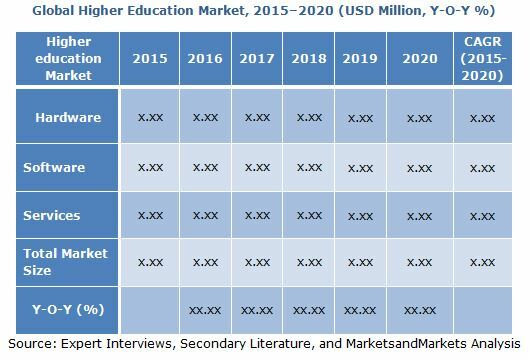 Higher education market is a broad study of the global market and forecasts the market sizes and trends in the following sub-segments. The global higher education market comprising software and services is expected to grow from USD 47.95 Billion in 2015 to USD 70.62 billion by 2020, at a CAGR of 8.1%. North America is expected to have the largest market share in the overall market in 2015. The higher education market is commonly defined as learning that is imparted through contexts such as social and content interactions with the help of hardware such as personal computers (PCs), interactive white boards (IWBs), projectors, tablets, and printers. These solutions are focused on improving the overall learning experience for the end users that require constant and situated learning support. Higher education consists of solutions such as content and collaboration, campus technology, data security and compliance, student and curriculum, and performance management pertaining to the organization. The emergence of these solutions has been beneficial for the main stakeholders present in the ecosystem. The solutions have broadly expanded their offering portfolios and have also been influential in boosting their revenues in different markets. The higher education market is experiencing an evolution, since the traditional way of learning has been replaced by digital and distance learning. Earlier, the higher education institutions were more service-oriented and focused on traditional ways of teaching. In the early 1990s, higher education was more lecture-based and educator restricted. Over the last decade, institutions have moved to digital teaching and in doing so, have adopted student-to-technology methods. Higher education institutions are evolving at a fast pace, with universities encouraging interactive ways of teaching. Colleges and universities have integrated learning management systems and student information systems to ease the overall workload within the campus. In the coming future, universities are expected to be more concerned about the IT security within the campus, as an open network in the form of internet is available to the students and faculty. Adoption of device-based computing, increased connectivity of hardware, emergence of online and collaborative learning, and personalization of technology are some of the prominent factors driving the adoption of higher education software and services. Moreover, new developments in technology, strategic alliances and partnerships, and ease of deployment provide opportunities to the higher education solution providers. The overall higher education market size in this study has been defined as the spending by user types such as state universities, private universities, and community colleges on higher education software and services in the form of annual software license and subscription charges, and the revenues generated by the vendors globally across various regions, namely, North America, Europe, Asia-Pacific, Middle East and Africa, and Latin America. The global higher education market which comprises hardware, software, and services is expected to grow from USD 47.95 Billion in 2015 to USD 70.62 Billion by 2020, at a Compound Annual Growth Rate (CAGR) of 8.1% from 2015 to 2020.